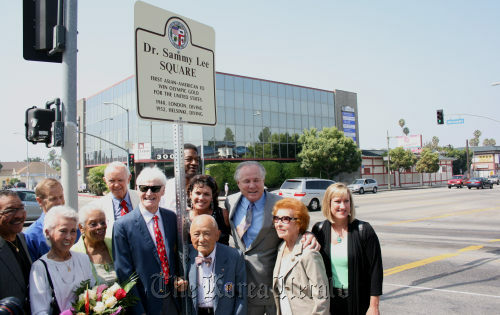 The City of Los Angeles dedicated Dr. Sammy Lee Square at Koreatown on Aug. 5 to commemorate the second-generation Korean American two-time Olympic diving gold medalist. The city council passed council member Herb Wesson’s motion on July 21 to name the intersection at Olympic Boulevard and Normandie Avenue as Dr. Sammy Lee Square, the council said on its website. Wesson represents Tenth District including Koreatown. The dedication ceremony was attended by Wesson and another council member Tom BaBonge, Sammy Lee’s family, Olympians from Los Angeles, Michelle Park Steel, member of the California State Board of Equalization, and about 100 other Korean Americans. A small reception was also held for Lee who turned 90 on Aug. 1. Sammy Lee is the first American of Asian descent to win an Olympic gold medal for the United States. Sammy studied pre-med at Occidental College. After the outbreak of World War II, he enrolled in an “accelerated program,” completing the normal four-year curriculum in just three years. He received his MD from the University of Southern California Medical School in 1947. He was a major in the U.S. Army Medical Corps. In 1942, at the age of 22, Sammy competed in the National Diving Championships and became the first non-Caucasian to win. The 1940 and 1944 Olympic Games had been canceled due to the war. Not until 1948, at age 28, could Sammy bid for his first Olympic medal. He astounded the world by winning a gold medal in the Olympic men’s platform and a bronze medal in the 3-meter springboard. In the 1952 Games, he won his second gold medal. At 32, he was the oldest person to win a gold medal in diving, and the first male diver to win back-to-back diving gold medals. His father was a dedicated patriot for Korean independence and a close friend of Syngman Rhee, who was the first president of South Korea. He is the only Asian-American to have won the James E. Sullivan award as the U.S. outstanding amateur athlete.